What’s up, interbutts! It’s one of those posts that encompasses a whole two days! Whoa! 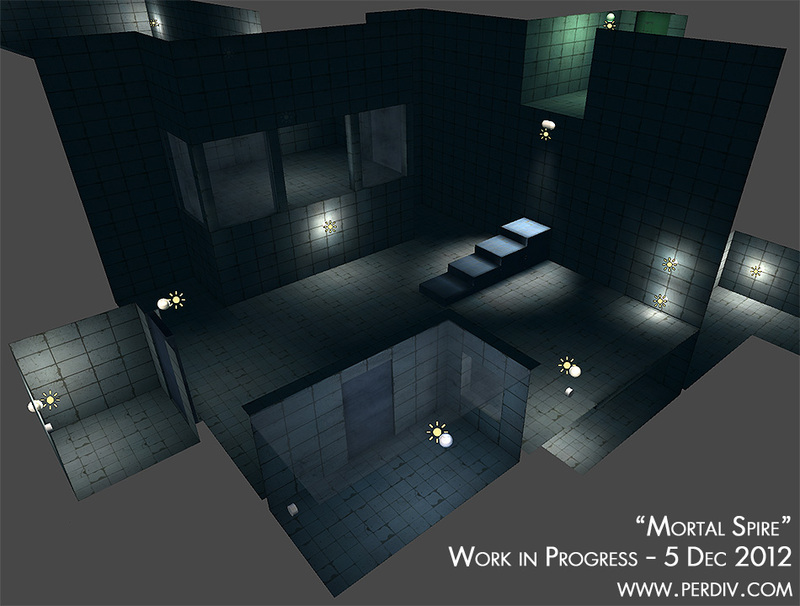 I continued the construction of Chamber 2, mainly I scripted and implemented the mechanics for the last room in the “maze” at the beginning of the level. It was mostly just a matter of rewriting some past scripts, adding or removing functionality where necessary. The last room in the maze should be interesting to see the feedback for once I get to the testing phase, as said mechanic could best be described as “mildly mindfucking.” Pardon the French. Other than that, I also expanded upon the level itself in UDK, the basic layout, so to say. After a bit of sitting in the sofa, scratching my beard, I came up with the design and ‘puzzle’ for the next Instance/room. It follows the maze/confusion/aha-moment philosophy I employed in the first Instance (the connected maze-corridors) to some degree. Without revealing too much, I’ve designed it to establish an expectation of what should happen within the room. Instead of this expected chain of events, there’s a little surprise at the end. I decorated and implemented all the mechanics for the last Instance in Chamber 2, the one with the aforementioned surprise. Nothing too complex, I already had all the scripts I needed, so I could spend a bit more time on the visual presentation of the room instead. After that, I built the remaining parts of the level in UDK; the path up to the Interval door and the Interval itself. The Interval’s not completely finished just yet, I’ll add some finishing touches to it tomorrow to make it more visually interesting, since it is a form of reward for the player after all. Overall, work today went really well and smooth. I got a lot of stuff done, I guess that’s a lot thanks to the fact that I didn’t have to make a bunch of new scripts and try them out. Before I call it a day, here’s another one of those screenshots. Who doesn’t like them screenshots?